After the let down that was the last Pokemon Alpha Sapphire and Omega Ruby ‘teaser’, we finally get a full on game trailer thanks to the Nintendo presentation at E3 2014. From seeing the land of Hoenn rendered in Pokemon XY graphics to seeing new Mega and Primal Evolutions, this trailer had it all. The down side of course, we learned 90% of this and more in the Corocoro Magazine released over the weekend. On the bright side, whether you already knew most of this or you’re learning this for the first time, this trailer did have something new for everyone. So let’s recap and move forward with everything E3 has taught us. And so we return to the Hoenn region. It’s rather ironic that we just spent so much time transferring our Pokemon from Ruby&Sapphire up through HeartGold&SoulSilver, Diamond&Pearl, Black&White 1/2, and finally to Pokemon X&Y just to end up in a remake of those very same Generation 3 titles. Let’s not think of that though; and instead focus on the brand new graphics. 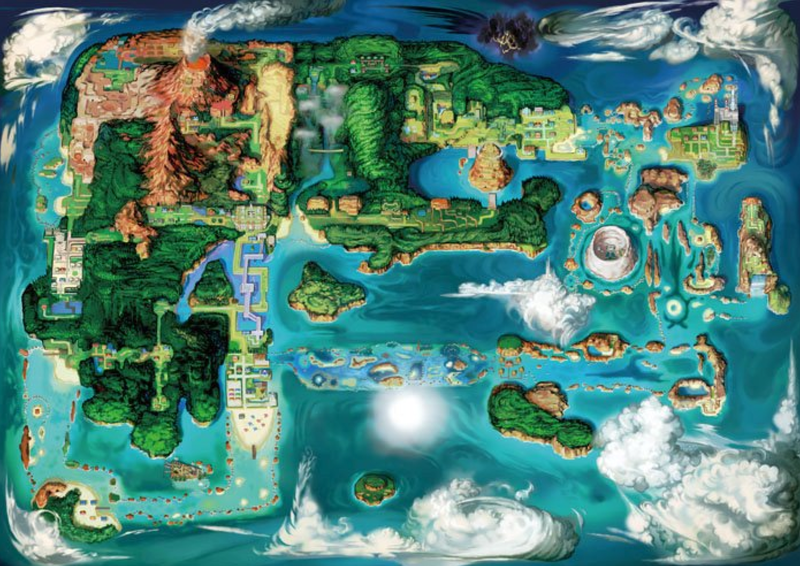 Now I’ll always be a sucker for the old sprite/2D graphics, but I do have to admit the revamped map of Hoenn looks great. There seems to be some minor differences in the geography; but overall everything looks the same – though I wonder if that dark cloud up top is stylistic embellishment or a new area. It wouldn’t be a new Pokemon game without Mega Evolutions it appears; and each of the starters now have new and improved forms via Mega Evolution. Unlike previous games, Mega Evolution will take place via the Mega Bangle item, which will function much like its XY predecessor the Mega Ring. For a full break down of Mega Sceptile, Mega Swampert, and even Mega Diancie’s new abilities and typings; please read my Mega Evolution’s article. As for Primal Evolutions, they are something completely different. 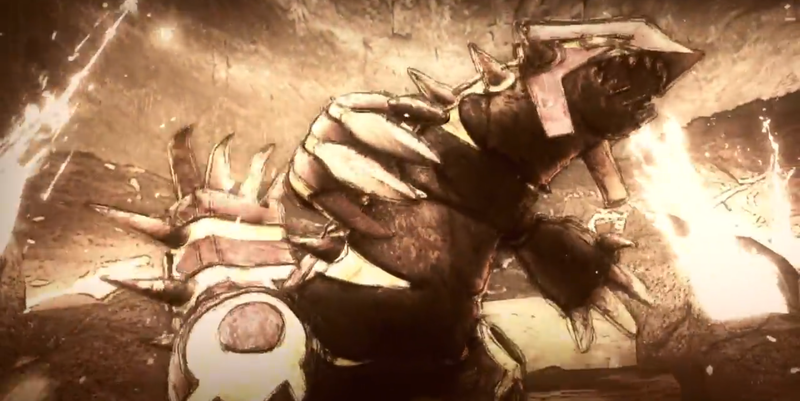 Originally revealed as ‘Ancient Devolutions’, the E3 reveal has chosen to dub these new forms Primal forms and give us a bit of insight into what they are and whom they effect. Initially, it was unclear if this would be an alternative to Mega Evolution and other Pokemon could resume their ‘prehistoric’ forms as well. Though thanks to the footage and these being called ‘Primal Forms’ – rather than their originally revealed ‘Prehistoric forms’ – this paints the picture that these are the forms taken by Pokemon before the world was formed. Since Groudon and Kyogre shaped the land and seas, these forms predated most other Pokemon aside from Palkia, Dialga, Arceus, and other early Legendary Pokemon. After their long slumber, their powers surely lessened and they assumed their modern forms. 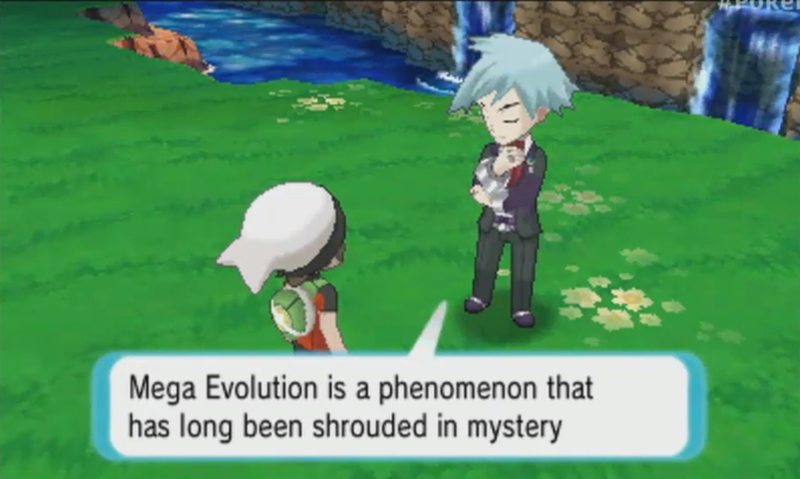 This means Primal Evolution could also be possible for other such early legendary Pokemon. Though it hasn’t been confirmed yet, the Pokemon most likely to get a Primal Evolution is Rayquaza. How Primal Evolution will change Groudon and Kyogre has yet to be specified, but we do know that they will get increased powers, new abilities, and even new signature attacks it seems. Groudon’s typing changes as well from pure Ground to Ground/Fire – which is what we always kind of assumed he was. This type change gives him an astounding x4 weakness to his rival Kyogre, which seems dumb; but there’s a chance Kyogre’s form change could give him a weakness as well. Judging from the video of Primal Kyogre swimming, it seems as though he is eradiating a bioluminescence from within his body through a thin outer skin. What does this all mean you ask? Well, its entirely possible that Kyogre’s Primal Evolution would change this deepsea leviathan from pure Water to Water/Electric, which would give it a weakness to Primal Groudon’s Attacks. If these two are such rivals, then Primal Groudon’s excessive weakness to Kyogre must be dealt with. Though another option is that their new abilities that will make Primal Groudon’s x4 weakness to water more manageable, and return these two behemoths to rivals on equal footing. The biggest piece of new information we got from the trailer was the release date. Pokemon Alpha Sapphire and Omega Ruby will be available in Japan and US/North America November 21st and in Europe November 28th. More news is sure to come – not only for this but also for any remaining Pokemon XY events – so stay tuned! i liked the trailer it is well put together.